During the Genesis’ heyday, Sega was enjoying the rewards of it licensing agreements with third party companies. Sonic The Hedgehog was a massive hit, and publishers were looking for the next great platformer success. One company, Accolade, perhaps came closer than most with its furry bobcat star Bubsy, created by industry veteran and accomplished author Mike Berlyn. With three sequels across multiple platforms, it seemed like Bubsy would share in the fame that Sonic had brought to the genre. 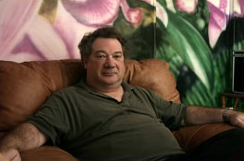 Berlyn knew his way around games, through his involvement with the Infocom text adventure game design team, as well as with several smaller software houses. He’s worked on dozens of titles for both PC and console, and has even taught at Harvard. As an author and designer, Berlyn’s last console title was Syphon Filter for the Playstation. Tired and unhappy with the direction the gaming industry had taken, he left gaming shortly afterward. Currently, he heads his own company, Berlyn & McClung, Inc., which specializes in consultation, programming, and website design. Recently, Sega-16 spoke to Mr. Berlyn about his experience with Bubsy. Sega-16: How did you get started at Accolade? Mike Berlyn: I had left Electronic Arts, where I was producing, to pursue the creation of new products. Sam Nelson, a then-producer at Accolade, contacted me and asked if he could purchase an adventure development system I had created. The idea was to merge my system with the graphical development system Steve Cartwright had created and end up with graphic adventure games. I joined Accolade as a result, worked on Steve’s game, my own game, then started working on other kinds of games. Sega-16: You joined Accolade not long before its court victory over Sega. Even though it wasn’t an official Sega licensee, it still continued to produce games for the Genesis. Was this ever an issue during your tenure there? Mike Berlyn: Yes. It was a constant issue, a constant pressure, and during the reverse engineering process, which was done according to legal requirements, I was designing in a vacuum, without knowledge of what could be done. We would get daily updates on the lawsuit status, and needed to be careful about what we said and to whom we said it. We needed to keep morale high, but a few of us (myself included) were not as optimistic as we should have been. I quickly learned what it meant to be a team player. Sega-16: You once said you played Sonic The Hedgehog for 16 hours straight before beginning work on Bubsy. How much of that experience actually made it into the game? Mike Berlyn: Not enough for my tastes. Sonic was the Sega equivalent of the brilliant Mario games — a compelling reason to buy a Genesis. I was overwhelmed by the design and the way it took advantage of the Genesis’ strengths. The height and width of Sonic‘s levels was so brilliantly managed, it taught me more about side-scrollers than anything else. 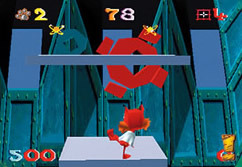 The “traveling through air” leaps that sonic made, landing on the ground or a platform unharmed, was the springboard for Bubsy’s glide. Sega-16: Were you surprised at Bubsy’s initial success? Mike Berlyn: Yes, and no. I was hopeful, and we had a put a lot of work into it. The marketing push and advertising commitments were massive, and I had never before been associated with a product that had such financial support. As far as the product’s success, I did the best I could and crossed my fingers. I was more surprised at learning what a real marketing effort was: the money, the manpower, and the thought that went into it. 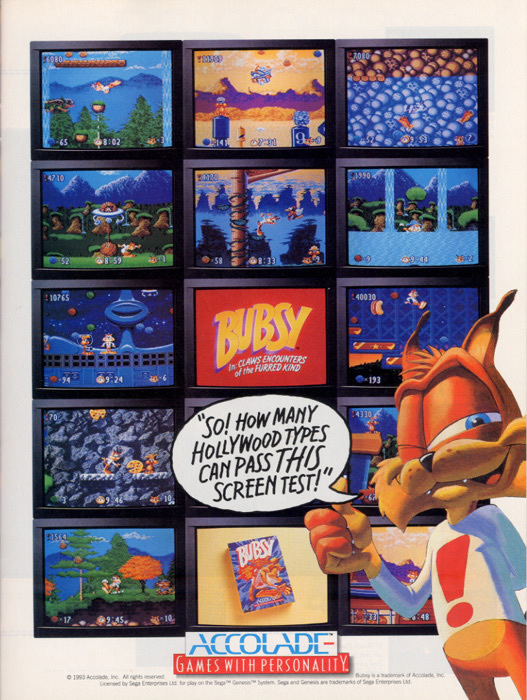 Sega-16: You weren’t involved with Bubsy II, and didn’t seem happy with how it turned out. Mike Berlyn: Not only true, but an understatement. I left Accolade to start a development business with a business associate from the past right before Bubsy II was started. The project was given to someone who hated the character, and you can see the result. Sega-16: Did Accolade ever make an attempt to bring you on board for the sequel, or had they always planned to handle it themselves? Mike Berlyn: Accolade and I had parted ways after the first Bubsy shipped. I had some ideas for other side-scrollers and was developing new characters, but Accolade was not interested in pursuing them. I think they were more than a little shell-shocked by the amount of money they needed to spend to launch a product like Bubsy. Al Miller, the then-president of Accolade, was very clear about the risks that making a commitment like that created for the company. Sega had deep pockets, received a licensing fee for everything everyone shipped on their console (except Accolade’s products), and owned the most successful franchise on the platform. They could promote whatever product they liked, whenever and wherever they liked. But Accolade was not in that position, so they took a more conservative approach. Sega-16: Were you involved at all with the Bubsy TV pilot? What did you think of it? Mike Berlyn: I was not involved at all. I thought it was extremely clever — it did a nice job of playing on Bubsy’s name, and the characters were all “Bubsy-like.” While the art direction was not what Bubsy was all about, it was at least interesting. Bubsy‘s original art direction was an interpretation of the Fleischer cartoons of the 1920s and 30s. The rounded, bouncing, alive cars and objects was what I wanted, and after a lot of work, was accomplished. The TV pilot had a more southwest, angled feel, and that was okay since the sponser was Taco Bell (if I recall correctly). The attitude and wisecracks were Bubsy, though. Sega-16: What was it like coming back to the franchise for part three? Mike Berlyn: A little like being a re-animator. Bubsy was dead and buried as near as I could tell. Accolade’s choices about doing Bubsy II in-house with the development team selected was a mistake that pretty much buried him. He was my guy, my pal, and we couldn’t hang around together anymore. When I had the chance to bring him back, I was overjoyed. Sega-16: The transition from 2D to 3D must have brought some exceptional challenges, especially in that age of early 3D platforming. Mike Berlyn: Again, this is an understatement. I had no tools for drawing environments, no controller precedents that I could rely on, no way to relate polygon count to the kind of design I was visualizing, and throughout all of this, there had been no 3D platform games before. Remember: platform games were side scrolling, and side scrolling had no meaning in 3D. Sega-16: Was it hard to get back into sync with the characters on the new hardware, after so much time away? Mike Berlyn: The characters were the fun part. Creating creatures for Rayon was the fun part of the project, and everyone working on the project would tweak the characters and make them better. We were overwhelmed with technical issues, so the creative part was the only relief in mind-numbing days. Sega-16: Had it not been for Super Mario 64, how well do you think Bubsy 3D would have done? Mike Berlyn: Please, you have to ask? I remember going to CES and showing a beta version of Bubsy 3D, while Nintendo was showing a shippable version of Super Mario 64. My partner and I both looked at Mario at the Nintendo booth and knew we had to double Bubsy 3D‘s complexity. But it was too late in the development cycle, and Accolade was (rightly) pushing for a finished product. If Mario hadn’t come out, I am sure we would have done a lot better. Sega-16: Many successful 16-bit mascots were unable to endure the transition to the 32-bit consoles. Why do you think Bubsy was one of the few to actually have a sequel come to market? Mike Berlyn: Bubsy II failed due to mismanagement of the character. It was done by people who, no matter how talented and interested they may have been, had not understood the original vision. Accolade wanted to enter the Playstation market with a product that was recognizable, and Bubsy I had been their best-selling product. It was a sound marketing decision. Sega-16: Do you think Bubsy could ever make a comeback, on perhaps mobile phones or handheld gaming systems? Mike Berlyn: Not without me. 🙂 But seriously, you’d have to tell me who bought Accolade, and with whom the Bubsy franchise resides. Our thanks to Mr. Berlyn for his time and candor. For more information on Bubsy, be sure to read our complete retrospective.